2-4 or more if you dare! Twister is the simple action game that will have you seeing spots as it “ties you up in knots”. It will test both your balance and flexibility. 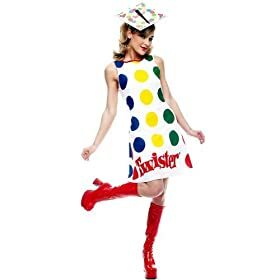 As an aside, if you’re looking to be original at the next fancy dress party, check out this adorable Twister game adult costume! The Twister game is a snap to set up and play. First, lay out the large game sheet, then assign someone to do spinner duty. Remove your shoes (and maybe your socks, too, so you don’t slip), and get ready to stretch your limbs! Competing players face off on opposite sides of the Twister sheet, which looks like it has giant Skittles on it. The person manning the spinner gives it a twirl and calls out the directions it reads.Commands will either be for a player’s hand or foot and right or left. The pending move will also include a color from the board – red, yellow, blue, or green, kind of like a stoplight. Contenders must then perform what has been called out by placing the appropriate body part on the corresponding color. Players can never share spaces, which is part of what makes the game difficult. You also aren’t allowed to move a body part from its assigned circle until that same body part is redirected to a new spot. As soon as somebody falls or rests a knee or elbow on the game sheet, that player is out. The last man standing wins. Twister is a classic that can be played both indoors and out. It can complement a birthday party or sleepover. It’s a silly form of exercise that is appropriate for a wide age range. It can be played in teams and also with no spinner at all. Twister can’t be played by those with physical difficulties, however. There’s a risk of injury, no matter how fit a partaker is. 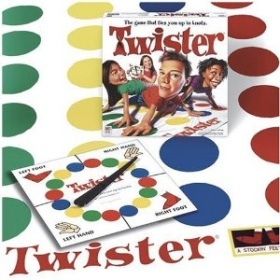 The Twister game is a game choice that’s great for parties and group fun. It will make you tired, but you won’t grow tired of playing. We brought the game out again after a pause between what we thought were age-appropriate children. We couldn’t have been “wrong-er”. No sooner had I placed the mat on the floor, 4 and then 5 kids came out of the woodwork almost begging to play. The oldest “participant” was 54, the youngest 5 years old. We played several rounds, belly-laughing through them all. Only wish was that the mat was a bit larger. Twister has been an important and memorable part of almost every party I’ve attended. Providing you know the people you’re playing with, you’ll find that Twister gives any party the activity it needs to include everyone; that’s what’s so great about it, everyone can play no matter what age or skill level. Twister gets 5 stars for the crazy, hilarious, ‘kodak moment’ memories it never ceases to offer.